As the nation reels from the deaths of seventeen students and faculty at South Florida's Stoneman Douglas High School yesterday - the eighteenth school shooting this year - questions are again being raised about what can be done to protect students from similar attacks. 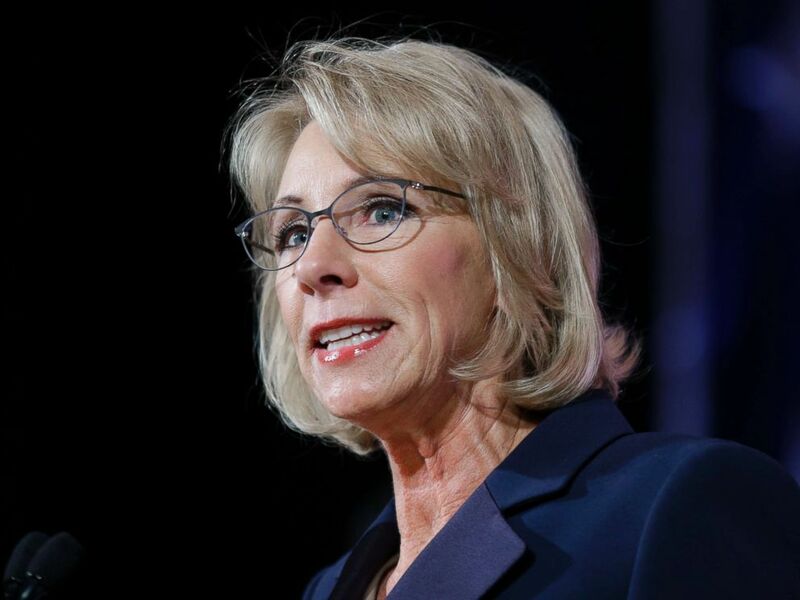 Asked by conservative radio host Hugh Hewitt if arming teachers could solve the problem, Education secretary Betsy DeVos said states "clearly have the opportunity and the option" to allow teachers who've had weapons training to carry guns on campus. "This is an important issue for all states to grapple with and to tackle," she said. "I think this needs to be part of the broader, more robust conversation about how can we avoid these things in the future, and how can we ensure that when my child, your child, goes to school in the morning, they're going to go to a safe and nurturing environment." U.S. Education Secretary Betsy DeVos speaks during a dinner hosted by the Washington Policy Center, Oct. 13, 2017, in Bellevue, Wash. Asked about DeVos' comment, Sen. Chris Murphy, D-CT, told ABC "there’s zero evidence - empirical or anecdotal - that more guns leads to less gun crime." "We have seen multiple instances in these mass shootings where there were plenty of people who were heavily armed and it didn’t stop the assailant," he added. This wouldn't be the first time DeVos has drawn fire for her stance on guns on campus: During her confirmation hearing in January, DeVos suggested guns could be used in schools to ward off "potential grizzlies," prompting late-night TV ridicule. On Thursday, DeVos, who said she was heartbroken for victims' families, suggested the country should also focus on mental health. The suspect in Wednesday's attack, 19-year-old Nikolas Cruz, posted "disturbing" content on social media, according to the Broward County Sheriff's Office. "It seems clear that this young man put up lots and lots of signals and warning signs," DeVos lamented. "We've seen lots of discussion about this every time we’ve had another incident. We've seen, you know, lots of finger-pointing back and forth. But we need to have a conversation at the level where lawmakers can actually impact the future."